Jessica Brooks, 2014, Television Food Network, G.P. All Rights Reserved. 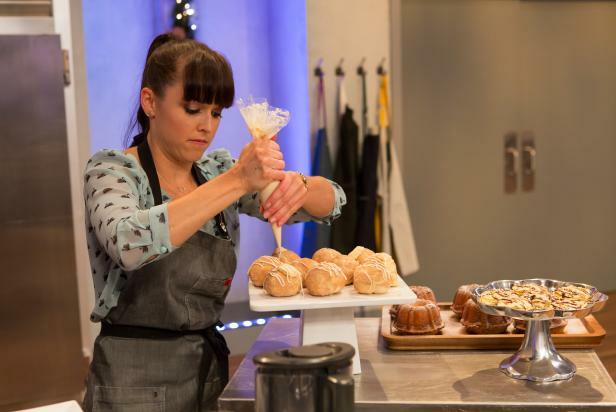 This past Sunday on Holiday Baking Championship, the competition was all about holiday traditions. The bakers were faced with the pre-heat challenge of creating something original using the classic combination of hot chocolate and peppermint. Then, they moved on to the real challenge: creating an over-the-top holiday breakfast including three sweet treats. Although her hot chocolate cakes from the pre-heat were praised by the judges, Terra was ultimately eliminated when her cream cheese surprise went awry. But this bourbon-loving Kentucky girl brought lots of fun and flavor during her time on the show. Terra made sure her stance on bourbon was known from the very beginning by dumping it straight from the bottle into her culinary creation. By the second episode, it had already become a tradition for her to include bourbon in her confections. Terra added it in during the sugar and spice challenge, impressing the judges. And then she added a little more in the eggnog for good measure. She changed things up during the third episode with pie—Bourbon Pecan Pie, of course. Then, Terra surprised the judges by rolling pre-made pie crust in graham cracker crumbs to give it more texture. And although she went home after the judges were unimpressed with her cream cheese surprise, there's no doubt in her mind she'll continue to follow her passion in the kitchen. Visit the Holiday Baking Championship page to go behind the scenes with photos and videos of the competition, and get to know the expert judges and the talented bakers. Connect with fellow fans on twitter using the hashtag #BakingChampionship.